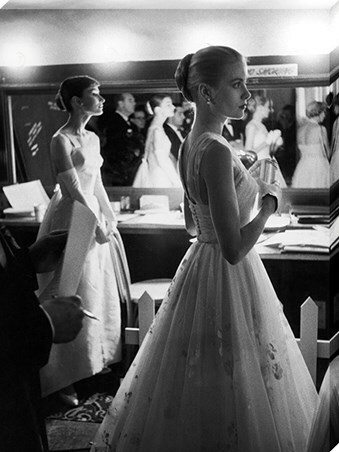 Preparing to present awards at the 1956 Oscar's, Audrey Hepburn and Grace Kelly look truly elegant in white dresses, whilst waiting backstage at the RKO Pantages Theatre where the ceremony was held. If you're a lover of these two, incredible women, then this magnificent black and white canvas from time life, is a must have to add to your memorabilia. High quality, framed Audrey Hepburn & Grace Kelly Large Canvas, Time Life large canvas print with a bespoke frame by our custom framing service.